Eat more leafy greens! 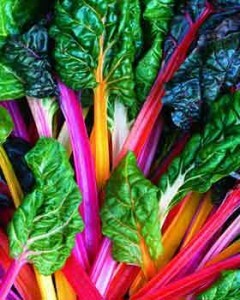 Chard is a wonderful way to meet your leafy greens quota. It belongs to the same family as beets and spinach and is slightly bitter, slightly salty. Chard is incredibly high in vitamin K (for bone health), vitamin A for beta-carotene, and minerals like iron, magnesium and manganese. Magnesium is important for bone, muscle, and nerve health, especially cardiovascular function, and most people don’t get enough of this important mineral. It can promote restful sleep and calm muscle cramping. I’m always telling people to eat more greens. Why? Greens are one of the most nutrient-dense veggies you can add to your diet and should be the foundation for almost every meal. Choose from kale, beet greens, rainbow or green chard, mustard greens, dandelion greens, or mixed salad greens, but always choose dark leafys. These contain the highest nutrient levels, are relatively good sources of fiber, and are powerful anti-cancer foods due high levels of phytochemicals and chlorophyll. Don’t like greens? Try adding them to smoothies. Add a handful of spinach to a smoothie with banana and berries, maybe some protein powder (NOT SOY – try whey or brown rice protein), maybe some ground flaxseeds. You won’t even taste the spinach. Or, there are many green food powders on the market that contain concentrated superfoods and greens like kale, spinach, and spirulina/blue green algaes (VERY high in trace minerals) that you can add to smoothies to mask the taste. Try Green Magic or VitaMineral Green. Easy Recipe: remove leaves from stalks and chop stalks; place stalks in salted, boiling water for 5-10 minutes or until tender. Chop leaves. Chop several cloves of garlic and saute chopped garlic in olive oil or coconut oil for a few minutes, then add leaves to pan. Add chicken or vegetable broth as needed while leaves wilt under tender. Sprinkle with salt. Add stalks and toss all together. Eat as is (simple is delicious), or add a few drops of sesame oil to complement an Asian dish, or drizzle with some balsamic vinegar.